Muhammad Younas Saqi is the Chief Editor of Daily Dak and Muhammad Asghar Shahid is the Incharge of Online Edition. Daily Dak is a very good local newspaper of District Gujrat. where is your e paper?????? I WANT TO GIVE ADD FOR MARRIEGE OF MY SISTER LIVING IN GUJRAT MARAGHZAR COLONEY NEAR SALMAN CHUGHTAI LAB DIVORCED WITH ONE CHILD.MY CONTECT NUMBER IS 607693 CELL 03466871942,,,03446200446. 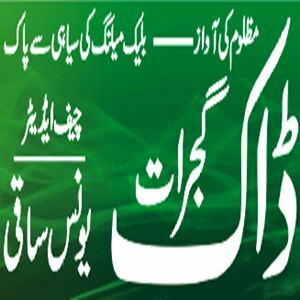 I like Dak Gujrat Urdu Newspaper.